I know it’s already Monday morning, and I’m a little late for Fish Fry-day, but nevertheless, here it is. 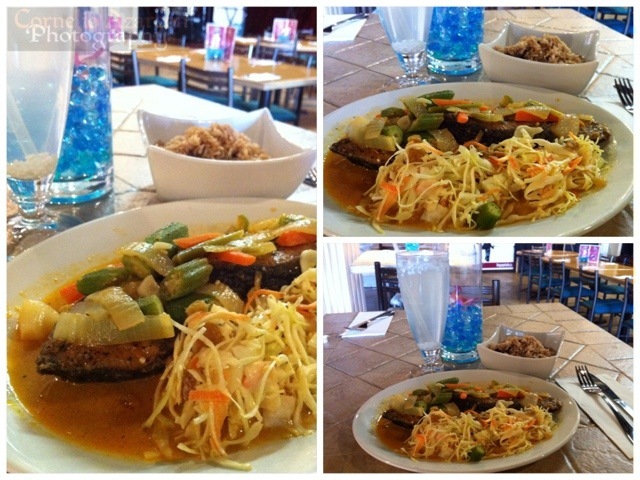 For lunch on Friday, I tried the coconut steamed king fish ($12.50) at The Gospel Cafe. It came with your choice of vegetables or coleslaw, and rice & peas. The fish tasted great, especially with hints of coconut, as well as the medley of sautéed vegetables such as okra, onions, and carrots that topped the fish. For a beverage pairing, the dish is best if complimented with coconut water ($2.50). Overall, I enjoyed the meal, and for what you pay, you get two pieces of king fish steak, which is not only well cooked, but packs a lot of flavour. Thanks for reading, and have a great week!